Here at Online Trading Academy, we follow a strict rule-based core strategy. Most other forms of education today tend to focus on traditional theories of technical analysis, whereas we focus on price alone. 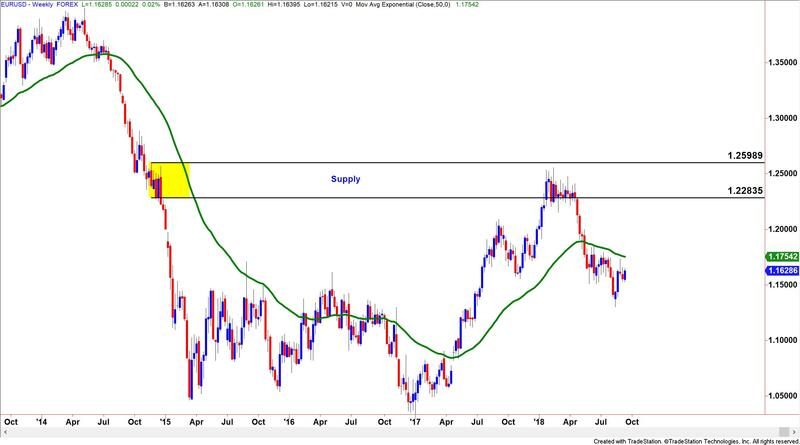 Price is dependent on the laws of supply and demand, which in turn helps us to build an understanding of what institutional order flow is and how it works across the Forex markets. When you can recognize buying and selling activity and you know what its picture looks like on a price chart, you will understand what the true areas of supply or demand look like. A focus on price allows me to keep my trading simple, yet there are times when technical indicators can also be used as a filtering tool. My personal choice would be the Moving Average, also known as the MA. 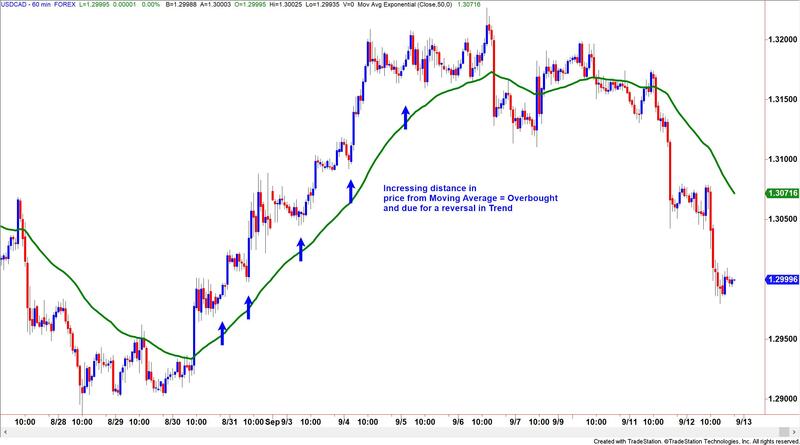 Like any technical tool though, we must understand that there are always pros and cons to using the moving average. Understanding what supply and demand looks like on a price chart before using any other analysis too is key, as pure price action always comes first. If we do respect price though, there is no reason why we can’t use a moving average to aid us in our trading. Let’s take a look at these four uses in a little more detail. In this example I have used a 50-period moving average. The 50-period moving average is a good setting to use when attempting to define a trend in the marketplace. Can you see how prices on the candlesticks are clearly trading above the Moving Average? This confirms the upward trend. With the trend confirmed, the trader can then focus on buying into this trend. However, what the moving average won’t tell you is when that trend is going to come to an end, as we can see on the right-hand side of the picture. That is why you have to understand what a supply zone looks like and a demand zone looks like, because they are the areas where the trend would likely reverse and the moving average will always be too late to give us this information. Some people use the Moving Average as a kind of dynamic support and resistance area to enter trades long and short when the price touches the MA. This approach does not use price as the primary decision-making tool, however, and can give many false signals along the way, especially in a ranging market like the one above. 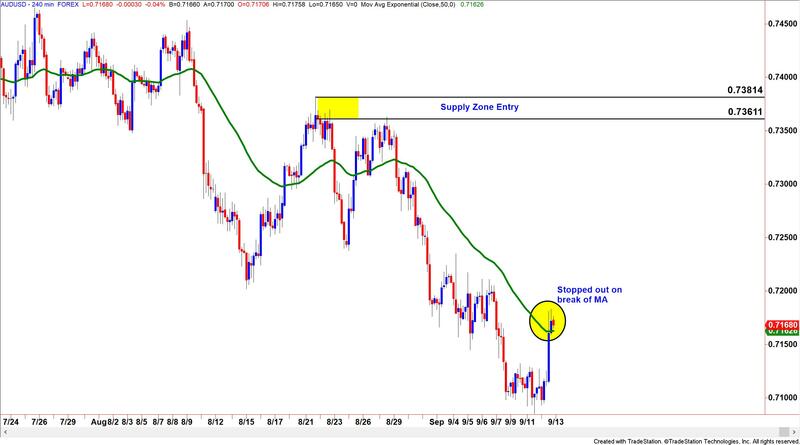 While this technique can be used from time to time in a trending market, a smarter approach would be to isolate an entry using supply and demand zones with a Moving Average as backup only. One of the things I like about moving averages, is that they can be used when you’re already in a trade as a fantastic tool to maximize your profit potential. 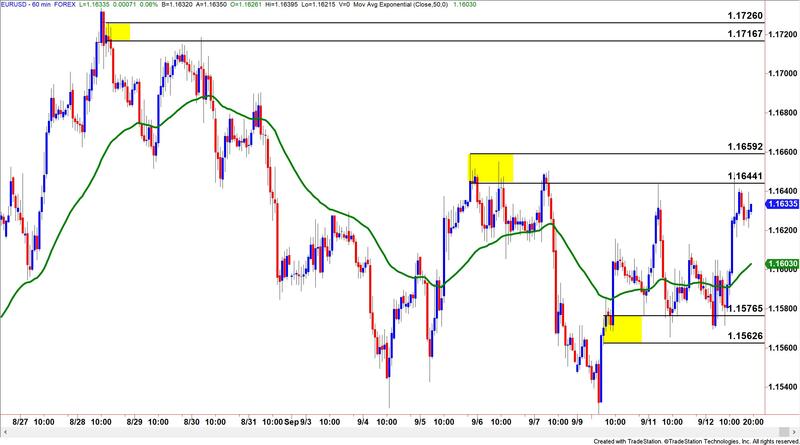 In the above example, we can see how after taking a trade at one of our supply zones, we then used the moving average to trail the stop technically. The rule employed was to close out the trade when the candlestick closed above the moving average. Using this technique in a rule-based trading plan can be a very objective method to take profit. As we all know, taking profits can be a real challenge for many traders, making them question whether they should get out or stay with the trade when it is working out for them. By using the moving average, this takes the thought process out and relies instead upon a simple objective rule, thus eliminating the emotions. Finally, the MA is a great way to measure conditions in the market when prices are overbought and oversold. In the above example, we can see prices moving in a parabolic fashion away from the moving average. Notice how steep the rise is in the candlesticks? The moving average is trading well behind the candles themselves with the distance increasing between the moving average line and the bodies of the candles. This shows us an overextension in price or an overbought situation. The reverse would be true in a downward trend. The further the candlestick moves away from the moving average, the more likely that this price trend is unsustainable. Prices are moving at a far greater rate away from their average than is sustainable. During these market conditions we would expect a currency pair to reverse at a sharp rate when confronted with a major level of supply or demand. The moving average helps in showing us when markets are going parabolic and when this movement is difficult to maintain. In conclusion, I would like to stress once again that if you decide to use a technical indicator in your trading toolkit, then make sure that you use the indicator in an objective way. One of the many reasons why I like moving averages is because they provide us with many different functions, all of which are not reliant on giving buying and selling signals. For that, I have price and supply and demand. I hope you found this useful. Staging a Home: To Do or Not To Do?